Just as rhythm guides our days, seasonal events and traditions frame our school year, and provide a way for our whole community of children, parents, caregivers, and teachers to come together at special times. Our celebration of fall that is open not only to our community but also our friends and neighbors. Our evening celebration of the coming of the Winter Solstice for the entire family. The children celebrate the coming of spring by growing grass in their own spring baskets. Parents and children picnic and dance around the Maypole. Parents join their children for circle time. Uniting the work of parents at home with the work of our teachers. Our annual festive fundraising event for the school. Joining together to spruce up our nests and garden at the beginning of the school year. A celebration of the last day of the school year. 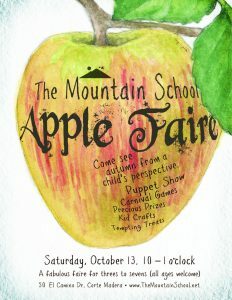 Learn more about the Mountain School at these events that are open to the public.